By now, the use of “lean, finely textured beef” (LFTB, known to its detractors as “pink slime”) in ground beef products is well-known. And that’s the problem. If its manufacturers had been proactive in disclosing (and even advertising) its use instead of waiting for others to define the debate, then they may have minimized their risk of huge financial losses. The purpose of this posting is not to take sides in the “pink slime” vs. “boneless lean beef” debate or to argue that one side’s arguments are more palatable, no pun intended. Rather, it is to highlight the importance of labeling, advertising, and promotional practices as part of a proactive risk management program. That’s why this blog addresses more than just food safety issues; regardless of the product’s purported safety or purity, the key issue appears to be the lack of disclosure to consumers. Why did it take 20-plus years for consumers to be able to identify what products contain this ingredient? How could BPI, the largest producer of this product, not have seen this PR train wreck coming? The irony of industry complaints about how the media have “smeared” the product and its producers’ reputations is that the industry’s wounds are almost entirely self-inflicted. The producers chose not to disclose the pervasive addition of the product to ground beef, so critics naturally focused on why it was concealed from the public. Iowa Rep. Steve King called for congressional hearings about the product’s critics, stating “they’ll have an obligation then to explain themselves why they could not base their allegations on facts and what they’ve done to damage an industry.” However, the congressman failed to address a key issue: if the producers had disclosed these “facts” proactively, there would probably have been no “damage” to the industry. Consumers for decades (if not longer) have expected their ground “100 percent beef” to appear this way, not this way. Similarly, BPI does not have even one picture of its product anywhere on its website or in its YouTube video rebuttals to films like Food Inc. Its published images portray children enjoying burgers and the high technology used to produce its product. Its videos feature company officers, a scientist who can’t make eye contact with the camera, and a lobbyist. The lack of disclosure begs the question of what else might be in food fed to children? Now, imagine that the companies producing this product had focused proactively on its claimed merits: that it’s a safe, sustainable, low cost, way to enjoy beef. 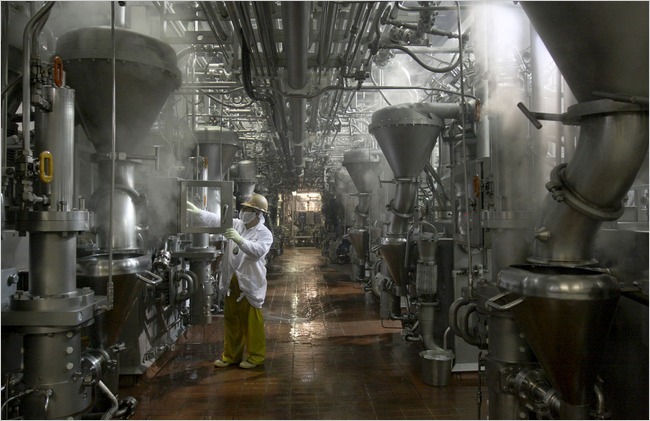 Photos of production machinery that looks like an indoor oil refinery just might appeal to the market segment that enjoys products like toxic waste candy. Perhaps a catchy brand name like “spin safe” ™ could have defined the debate about using centrifuges to separate fat from lean meat. Most importantly, calls for mandatory labeling of the product would become irrelevant; half of consumers do not read labels anyway. Lesson learned: manage labeling, advertising, and promotional issues proactively.